Valaciclovir used to suppress herpes simplex virus 2 (HSV-2) in HIV co-infected pregnant and post-partum women in Nairobi, Kenya, slowed HIV disease progression and reduced viral load in breast milk, according to researchers from the Universities of Washington, Nairobi and the Fred Hutchinson Cancer Research Center at the sixth International AIDS Society conference (IAS 2011) in Rome last week. Another study from Kenya showed valaciclovir reduced viral load in adults while a third from Uganda found that another herpes drug, aciclovir, also helped reduce disease progression. Maternal viral load during pregnancy and breastfeeding determines the risk of mother-to-child transmission (MTCT), so reducing maternal viral load is one of the main objectives of all prevention of mother-to-child transmission (PMTCT) programmes. HSV-2 infection is a risk factor for vertical transmission. Studies have shown suppression of HSV-2 with valaciclovir decreases viral load but its effect has not been studied in pregnant and breastfeeding HIV-positive women. The prevalence of HSV-2 infection among HIV-positive women is between 75 and 95%. The researchers hypothesised that HSV-2 therapy offers a strategy to reduce postnatal MTCT that is inexpensive, safe and easily incorporated into existing PMTCT programmes. The researchers wanted to see whether the positive effects of herpes suppressive drugs on viral load, seen in previous trials from which pregnant women had been excluded, would improve maternal health and reduce disease progression among co-infected pregnant and breastfeeding women in sub-Saharan Africa. Valaciclovir was chosen in preference to aciclovir because it is easier to adhere to, longer acting, more potent, does not need laboratory monitoring in pregnant and postpartum women, and is available as a generic. To evaluate the effects of HSV-2 suppression on HIV disease progression and vertical transmission of HIV, 148 HIV/HSV-2 co-infected pregnant women were enroled in a randomised, double-blind, placebo-controlled trial in Nairobi, Kenya, from April 2008 to June 2009 and followed until August 2010. At 34 weeks of pregnancy they were randomised to 500mg of valaciclovir twice a day or placebo until 12 months after having given birth. The women all had CD4 cell counts over 250 cells/mm3 and World Health Organization (WHO) stage 1 or 2 clinical disease and were not eligible for ART at the time of the study according to Kenyan guidelines. The women received AZT (zidovudine, Retrovir) at 28 weeks of pregnancy or later, and single-dose nevirapine (Viread) during labour or delivery for PMTCT, with a one-week tail of 3TC (lamivudine, Epivir). At the time of enrolment approximately 70% of the women in both arms were receiving AZT. The women in both arms had similar demographic and clinical characteristics with an average age of 25; most had one or two previous pregnancies and all breastfed. HIV levels were measured in the genital tract, breast milk and plasma. Alison Drake, one of the co-investigators, presented on the effect of valaciclovir on viral levels in plasma and in breast milk. Plasma and breast milk samples for viral load testing were taken during pregnancy (plasma alone), and then at 2, 6, 14 weeks and 6 and 12 months after birth. Of the 148 women, 145 had a postpartum visit. Mean plasma viral load at baseline was similar in both arms at approximately 3.9 log10 copies/ml. At 6 and 14 weeks after birth, the risks of detecting viral load in breast milk were 30% (p= 0.04) and 46%, (p= 0.01) lower, respectively, in the valaciclovir arm than in the placebo arm. Over the six-month period after giving birth, plasma viral load in the valaciclovir arm was significantly lower than in the placebo group (0.51 log10 copies/ml). The mother-to-child transmission rate at 13 months was 7% with no difference between arms. Dr Drake added that the trial was not designed to look at the effects of valaciclovir on vertical transmission. 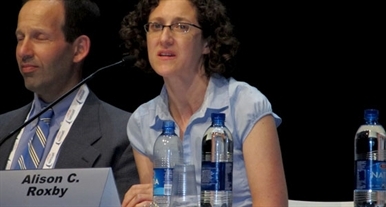 Dr Drake added that it is conceivable that valaciclovir has a different effect in peripartum HIV transmission when compared to sexual transmission, because of the prolonged exposure to HIV-containing bodily fluids during pregnancy, labour and delivery and post partum through breast milk. Alison Roxby, another co-investigator, presented findings on the effects of valaciclovir suppression of HSV-2 on HIV disease progression in the same cohort. CD4 cell counts and viral loads were measured at baseline (34 weeks of pregnancy) and at 12 months after giving birth. The median baseline CD4 cell counts in the valaciclovir arm and placebo arm were 452 cells/mm3 and 481 cells/mm3, respectively. Ninety-two per cent (132) of the women completed one year of follow-up after giving birth. Three women died (one in the valaciclovir arm), all after giving birth. This highlights the risk of childbearing for HIV-positive mothers in Africa, Dr Roxby stressed. Six cases of tuberculosis (four in the valaciclovir arm) were reported. CD4 cell counts continued to increase at 12 months after giving birth in the valaciclovir arm, and were 73 cells/mm3 (p = 0.03) higher than in the placebo arm. While all began with similar viral loads, by 6and 12 months viral loads were 0.40 log lower in the valaciclovir arm. Average monthly adherence measured by monthly pill count was high at 86% with many attaining 100% adherence. Use of valaciclovir, she added, is a cost-effective option in resource-poor settings where access to HIV treatment remains limited. These findings suggest valaciclovir could be used during pregnancy and breastfeeding to improve outcomes in HIV/HSV-2 co-infected women and their infants as an adjunct to ART prophylaxis in resource-poor settings. Drake A et al. Valaciclovir suppression reduces breast milk and plasma HIV-1 RNA postpartum: results of a randomized clinical trial. Sixth International AIDS Society Conference on HIV Pathogenesis, Treatment and Prevention, Rome, abstract MOAC0201, 2011. Roxby AC et al. Peripartum valaciclovir improves markers of HIV-1 disease progression in women co-infected with HSV-2: a randomized trial. TSixth International AIDS Society Conference on HIV Pathogenesis, Treatment and Prevention, Rome, abstract TUAB0202, 2011. View abstract MOAC0201 on the conference website. View abstract TUAB0202 on the conference website. View Alison Drake's slides, with audio, on the conference website. View Alison Roxby's slides, with audio, on the conference website.